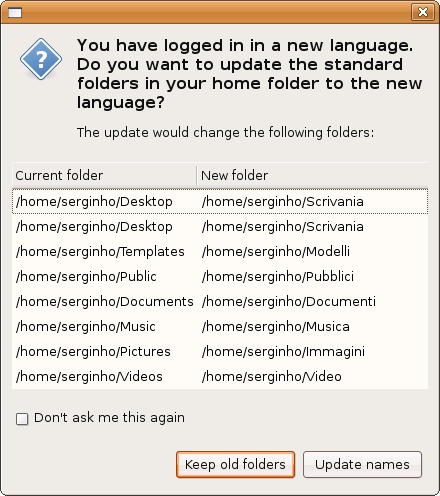 I installed Hardy alpha 3 in English language, updated today, then I changed language in Italian removing English, after rebooting came up a window asking for automatic folder name switching. Desktop Folder is reported twice. Did it do the renaming okay? All went ok, except for the Desktop folder one. "Desktop" contains 2 file (I had previously) and "Scrivania" is empty. but if I go to Risorse(Places) -> Scrivania it opens "Desktop" folder not "Scrivania". "The language it_IT doesn't exist. It'll be used System Default." This bug is quite serious, because it implies a bad inconsistency in folder names. I have a "Scrivania" folder (italian name for Desktop) but Risorse ("Places")->Scrivania ("Desktop") point to "Desktop" folder, not to "Scrivania" ones. Thank you for explaining gdm issue. About desktop location, maybe I explain it wrong. I don't want to specify a different directory. Just after installing Hardy, I installed Italian language removing English one. After rebooting came up a window asking for automatic folder name switching (related to xdg-users-dir) in which there were a problem. see 1st screenshot. Directly connected to this, after doing this automatic folder name switching, I have "Scrivania" place (in Places) pointing to "Desktop" folder instead of "Scrivania" one (which exist as well, created by automatic folder name switching). In sum, this automatic folder name switching renamed correctly "Documents", "Pictures", "Music", "Video" in italian, but created a double folder for "Desktop" one, pointing to the wrong one. ("Desktop" instead of "Scrivania"). I suspect this bug is not related to Italian language only but it affects all other languages. May someone try to reproduce it in another language in order to confirm it please? This bug lead to a worse thing. Programs like firefox 3 beta 3 or gnome-screenshot take "Desktop" as preferred folder for saving instead of "Scrivania". So if I go to Place->Scrivania it opens "Scrivania" and I can't find downloaded files. Do you have easy steps to trigger the issue? Perform a new hardy installation in English language. After rebooting you face this problem (and everything related). > Do you have easy steps to trigger the issue? I have the same problem in Brazilian Portuguese language. I stumbled on this bug after a fresh hardy install on a new computer. I installed the system in French (by mistake, but I'm in France) and switched to English after the install was completed, not removing the French localization. Both "Bureau" and "Desktop" files were present (all the other ones got properly updated). Mounted files were shown on "Bureau", which remained the actual desktop, when default screenshots were sent to "Desktop" for ex. I played around with symlinks with no success (showed as broken). Choosing English language at GDM and accepting the locale update got it straightened up. Same problem for me, after changing the language of the computer from English to French. I fixed by moving all contents of my old ~/Desktop folder to the new ~/Bureau, including the hidden file '.directory'. After that I logged out and logged back in and all was well. Forgot to mention, I also deleted the now empty ~/Desktop folder. Is this still an issue in the latest Ubuntu release (Karmic)?